I share my home office with my fiance, and we have a rule that we do not take phone calls in the office. 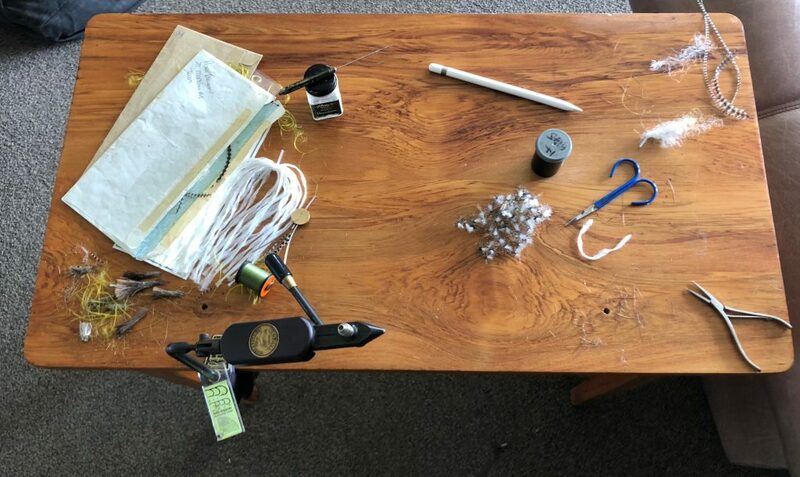 I had a very long conference call planned today so decided to set up my second tying station in my living room so I could tie while on the call. This station is my old tying station that has not been tied on since I built my office desk and built in my Norvise. So it was an interesting experiment. I used my old Regal Medallion vice, a vice which I strongly recommend if you do not have the budget for a Norvise. I have tied a lot of flies on a Medallion, and really like the strength of grip and the ease of use that are the features of the Regal. The one thing I immediately noticed with tying on my second station was that using a standard bobbin rather than a Norvise Automatic Bobbin is annoying, slow and frustrating. The Norvise bobbin, for those who have not used it, automatically winds about 20cm of tying thread back onto the bobbin if required, meaning shorter loops when tying in thread. This Norvise video explains the Automatic Bobbin extremely well. After tying with a standard bobbing today I am going make a bobbin holder for my second station and get another Norvise Automatic Bobbin. I’ll go further and say that if you have not tied with a Norvise Automatic Bobbin you should seriously consider buying one, and once you have I would be surprised if you would want to change back to a standard bobbin.